Jews in Kazakhstan have a relatively short history. While some Bukharian Jews from neighboring Uzbekistan have settled in Kazakhstan, the majority of Kazakh Jews are Ashkenazi, arriving as Russian army conscripts as early as the 17th century. No synagogues date back to this period; services were usually held in private homes. Under Communism, thousands of Jews were exiled by Stalin from the Pale of Settlement to Kazakhstan for practicing Judaism, most notably, Levi Yitzchak Schneerson, father of the late Lubavitcher rebbe, Menachem Mendel Schneerson. During World War Two, approximately 8,500 Holocaust-fleeing Jews settled in Kazakhstan. Today, between approximately 3,300 Jews live in Kazakhstan. They are predominately Russian-speaking and identify with Russian culture. Approximately 2,000 are Bukharian and Tat (Caucasion Mountain Jews). Almaty is the main Jewish center of the country. Smaller Jewish communities are spread out across this large country in places such as Karaganda, Chimkent, Astana, Semiplatinsk, Kokchetav, Dzhambul, Uralsk, Aktyubinsk, Petropavlovsk and several villages. The Kazakh Jewish community is fairly stable and organized. More than 20 Jewish organizations, both secular and religious, currently work to improve Jewish religious and cultural life. The Mitzvah Association (an umbrella organization), Chabad Lubavitch, the Joint Distribution Committee and Jewish Agency for Israel are among the most visible. In December 1999, the All-Kazakhstan Jewish Congress was created to unify the Jewish communities of Kazakhstan. Many government officials, as well as the U.S. Ambassador attended the founding session. In 2001, Chabad Lubavitch opened a synagogue and community center to house all its Jewish programs, including a Jewish day school, distribution of food packages, elderly care and a summer camp for children. 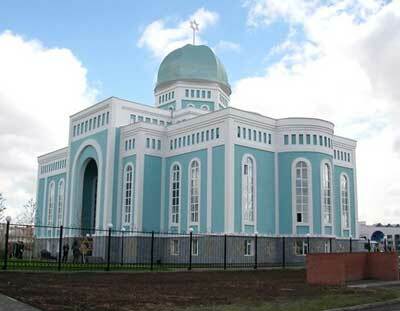 Chabad also operates a national organization, the Association Jewish Communities of Kazakhstan. The Joint Distribution Committee's main project in Kazakhstan is Hesed, a welfare center that also provides medical assistance. It is active in more than 20 communities throughout the country. The Jewish Agency for Israel sponsors a moadon (youth center) in several cities, the largest in Almaty. It is a popular hangout for Jewish teens and also teaches Jewish culture, history and Hebrew. In July 2001, more than 120 children attended the Jewish Agency's summer seminar in the hills outside Almaty, a 10-day lesson on Israel and Judaism. The campers, ages 12-17, came from all over Kazakhstan and neighboring Kyrgyzstan. While their knowledge of Jewish topics ranged widely, they all shared a Jewish identity, singing Hebrew songs, baking challot and drawing pictures of Jerusalem. Several campers also attend boarding schools in Israel. Since Kazakhstan's independence in 1991, Jewish education has grown steadily. There are 14 Jewish day schools spread out over the country, serving more than 700 students. While anti-Semitism is not a great threat, it is still prevalent in Kazakhstan. Jews are occasionally beaten and harassed because of their identity. In 1997, after Kazakh KGB agents arrested Leonid Solomin, an independent Jewish labor leader and his associates, the Kazakh newspapers published a slew of anti-Semitic charges warning against "Zionists" and "international Jewry." One even called upon the people to kill Jews. Kazakh-Israeli relations are warm, and Israel assists Kazakh agricultural development through its MASAV program, including a five-year Aral Sea project with the U.S. Agency for International Development. In April 2000, Kazakh President Nursultan Nazarbayev led a delegation on an official visit to Israel, strengthening economic and security cooperation between the two countries. Kazakhstan also acted on behalf of the 13 Jews accused of spying in Iran. The Israeli Foreign and Agricultural Ministries inaugurated a project aimed at developing Kazakhstan's irrigation systems in May 2015. Government representatives from Israel and Kazakhstan attended the opening ceremony of the Israel-Kazakhstan Irrigation Demonstration Center in the Almaty region of Kazakhstan on June 3, 2015. Benjamin Netanyahu became the first sitting Israeli Prime Minister to visit Kazakhstan in December 2016, where he met briefly with Kazakh President Nursultan Nazarbayev and participated in a joint press conference. Netanyahu asked President Nazarbayev to support Israel's bid for a nonpermanent seat on the United Nations Security Council for the 2019-2020 session during the press conference, stating “if you want a real change in the world, image the State of Israel on the Security Council of the United Nations - that's a change... I think it's possible and with your help it will be realized.” Additionally, officials from the two countries signed a research and development deal, an aviation agreement, a statement on the establishment of an agricultural consortium, an agreement on cooperation in agriculture, and a civil service commission agreement. Israel purchases about 25% of it's oil imports from Kazakhstan. Since 1989, almost 10,000 Kazakh Jews have moved to Israel. Photo of Synagogue courtesy of Embassy of Kazahkstan to the USA & Canada, other photo courtesy of Alden Oreck.